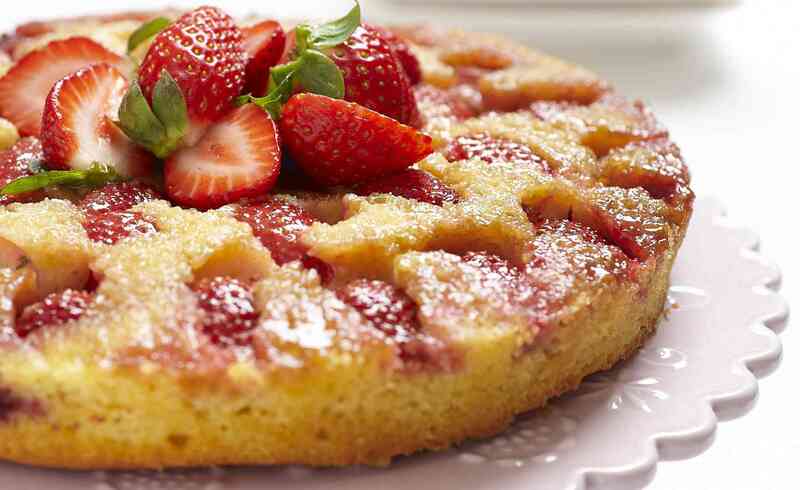 A delicious light and fluffy cake with strawberries baked into the top. Wine Match: Sparkling wine or Moscato. Preheat oven to 180°C. Cream the base butter and sugar until fluffy and spread over the base of a 20cm spring form cake pan lined with baking paper. Arrange ¾ of the strawberries attractively over the mix. Set aside. Cream the cake butter and sugar until fluffy and stir in vanilla and add eggs one at a time, mixing well between each addition. Fold the flour and milk alternately into the creamed mixture. Carefully spread cake batter over the strawberry base and bake for 45 minutes, or until a skewer inserted into cake comes out clean. Cool for 10 minutes in the pan, then invert onto wire rack to cool completely. Top with remaining berries to serve, and dust with icing if desired.